Local tradition claims that the Covenanters used the ruins as a place of refuge and as a hideout. Little more is known about who used it, or when this happened. The old Ordnance Survey map shown to the left idicates its location. 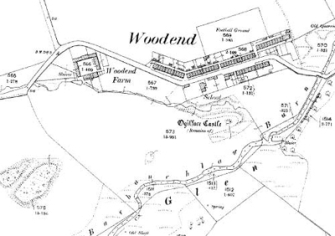 Note: the village of Woodend on the map no longer exists. Very little, other than mounds over foundations, survives of Ogilface Castle. It stood on a low promontory next to the Barnbauchlaw Burn.